4.1 - Physical and human geographic features that define places and regions in California. 4.2 - Social, political, cultural, and economic life and interactions among people of California from the pre-Columbian societies to the Spanish mission and Mexican rancho periods. 5.4 - Political, religious, social, and economic institutions that evolved in the colonial era. 6.3 - The geographic, political, economic, religious, and social structures of the Ancient Hebrews. 6.5 - The geographic, political, economic, religious, and social structures of the early civilizations of India. 7.1 - The causes and effects of the vast expansion and ultimate disintegration of the Roman Empire. 8.6 - The divergent paths of the American people from 1800 to the mid-1800s...with emphasis on the Northeast. 8.9 - The early and steady attempts to abolish slavery and to realize the ideals of the Declaration of Independence. 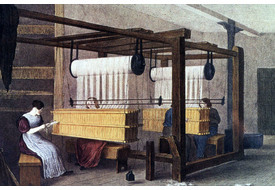 10.3 - The effects of the Industrial Revolution in England, France, Germany, Japan, and the United States. 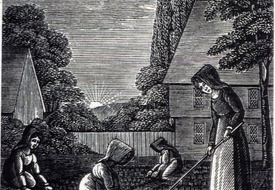 11.3 - The role of religion in the founding of America and its lasting moral, social, and political impacts, and issues regarding religious liberty. 11.5 - Major political, social, economic, technological, and cultural developments of the 1920s. 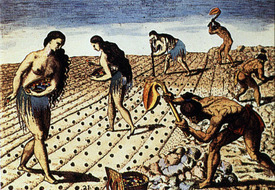 Card Text: Jacques LeMoyne, "Timucuan Women," Florida, 1560s, working in agriculture with men. 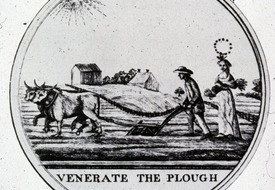 Men plowed and women planted beans and maize. "They be all naked and of goodly stature, mighty, faire and as well shapen…as any people in all the worlde, very gentill, curtious and of good nature… the men be of tawny color, hawke nosed and of a pleasant countenance…the women be well favored and modest…" French explorer Jean Ribault was impressed by these first Native peoples he encountered in Florida. The Timucuans under Chief Saturiwa, who met the French at the mouth of the River of May (later called the St. Johns River) in 1562, were one of a number of Timucua-speaking tribes who inhabited central and northern Florida and southeastern Georgia. Their way of life had remained essentially unchanged for more than 1000 years. Attacks, slavery and disease reduced their numbers. During the Spanish mission period (1595 - 1700) the Timucua population collapsed, from 50,000 people to 1,000, a loss of 98 percent. When the British took over Florida from the Spaniards in 1763, only one Timucua was reported to have survived. Citation: Library of Congress Rare Book and Special Collections Division, Washington, DC 20540. LC-USZC4-4821. Text: "Timucua," Timucuan Ecological & Historic Preserve Florida, National Park Service, 12713 Fort Caroline Rd, Jacksonville, FL 32225. https://www.nps.gov/timu/learn/historyculture/ timucua.htm. Nov 28, 2017. 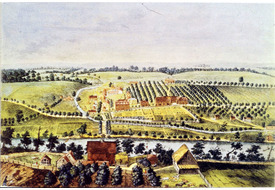 Card Text: Nicholas Garrison, "Bethlehem," PA, 1757, a Moravian community: "A view of Bethlehem, one of the Brethren's principal settlements, in Pennsylvania, North America." J. Noual hand-colored engraving. Citation: New York Public Library, Miriam and Ira D. Wallach Division of Art, Prints and Photographs, Fifth Ave & 42nd St, New York, NY 10018. Digital Image ID: 53929. Also, Palmer Museum of Art, partial gift and purchase from John C. O'Connor and Ralph M. Yeager. Acc. No. 86.396. Citation: Courtesy of The Wethersfield Historical Society, Town Hall, 505 Silas Deane Hwy, Wethersfield, CT 06109. All rights reserved. Our thanks to the Society. 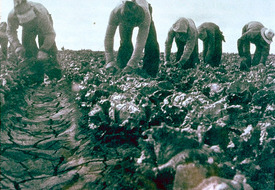 Card Text: "Filipinos working in lettuce field, Salinas, California," 1935. CA Standard(s): 8.12 - The transformation of the American economy and the changing social and political conditions…in response to the Industrial Revolution, 8.6 - The divergent paths of the American people from 1800 to the mid-1800s...with emphasis on the Northeast. 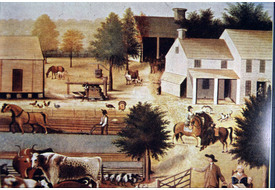 Citation: Courtesy of The Abby Aldrich Rockefeller Folk Art Museum, The Colonial Williamsburg Foundation, P.O. Box 1776, Williamsburg, VA 23187-1776. From the collection of Abby Aldrich Rockefeller; gift of David Rockefeller. 1933.101.1. All rights reserved. Our thanks to The Museum. 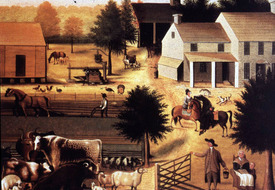 Card Text: Towards_Revolution34 "The Residence of David Twining, 1787," a farm in Bucks County, PA. Edward Hicks, oil, 1845-48. The artist is the boy at lower right, the Twinings his foster family. 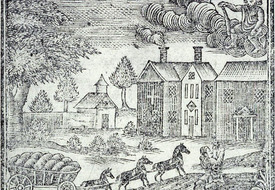 Citation: Courtesy of The Abby Aldrich Rockefeller Folk Art Museum, Colonial Williamsburg Foundation, PO Box 1776, Williamsburg, VA 23187-1776. All rights reserved. Our thanks to Colonial Williamsburg. Card Text: Maya wall mural suggesting an elaborate class system of a complex agricultural society, Bonampak, Chiapas, Mexico, c. 800 AD/CE. A rarely-preserved expression of Maya artistry – painting – comes to life at the archaeological site of Bonampak, in southern Chiapas, Mexico. The small site of three temple rooms houses one of the most famous painted murals in the entire Maya world. Bonampak literally means "painted wall." Vivid colors and masterful designs tell the story of the last ruling family of Bonampak, headed by King Chan Muwan and his wife Lady Rabbit. Calendar inscriptions date the painted scenes between the years 790 and 792 CE. The city was abandoned shortly after, and the murals were never completed. The paintings depict scenes of kingly accession and celebration, brutal warfare, and acts of self-sacrifice. Here members of King Ahau Chan Muwan's court display their power over their defeated rivals in a brutal battle scene. Painted around 800 AD/CE, these three rooms of paintings reveal in astonishing detail the ancient Maya at the end of their splendor, engaging in court rituals and human sacrifice, wearing elegant costumes and stripping the clothing from fallen captives, acknowledging foreign nobles and receiving abundant tribute. No other surviving work features so many Maya engaged in the life of the court, whether second-tier warriors presenting captives to the king or the king’s mother pushed to the side by her imperious daughter-in-law. Costumes, musical instruments, and the weapons of war are all rendered with great detail, making Bonampak an unparalleled resource for understanding ancient society. The ancient Maya began to build vast cities in northern Guatemala during the first millennium BCE, mastering a harsh tropical environment with shallow soils and annual cycles of deluge and drought. These first cities were the foundation of the greatest civilization of the ancient New World. By 700 AD/CE their towering pyramids and dramatic public monuments dominated dozens of Maya cities across what is now Honduras, Belize, southern Mexico and Guatemala. From at least the 5th century onward, lords at Bonampak skirmished with those from Yaxchilan, 26 kilometers away; but by the 8th century the royal families at the two cities had achieved peace. 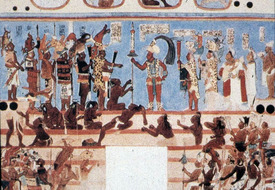 The king who commissioned the paintings at Bonampak, Chaan Muwan, married a Yaxchilan princess. By 800, when the paintings were nearly completed, the region was suffering from deforestation, exhausted farmland, and overpopulation. Some cities were burned to the ground; others were simply abandoned. By 900 the forest had begun to reclaim the area. Years later Spanish invaders found the region of Bonampak sparsely inhabited, although great Maya populations survived in Yucatan and Guatemala. Citation: Photo and first text: Copyright © National Museum of the American Indian, Smithsonian Institution, PO Box 37012, SI Building, Rm 153, MRC 010, Washington, DC 20013-7012. https://maya.nmai.si.edu/gallery/bonampak. All rights reserved. Second text: "The Maya Murals of Bonampak: Windows on an Ancient Culture." Copyright © 2017, Yale Peabody Museum of Natural History, 170 Whitney Ave, New Haven, CT 06511. http://peabody.yale.edu/ exhibits/maya-murals-bonampak. All rights reserved. Oct 1, 2017. Citation: American Antiquarian Society, 185 Salisbury St, Worcester, MA 01609-1634. 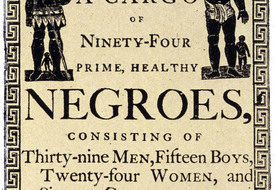 First text: Alexander Falconbridge, "An account of the slave trade on the coast of Africa" (1788), in Thomas Howard, ed., "Black Voyage-Eyewitness Accounts of the Atlantic Slave Trade" (Boston: Little, Brown & Company, 1971). Second text: Solomon Northup, "Twelve Years A Slave" (Auburn, NY: Derby and Miller, 1853) 78–82. Both on Mr. Baker's site, "Slavery." sites.google. com/a/magellancharter.org/8thgrade/mr-baker/slavery. The Magellan Charter School, 9324 Baileywick Rd, Raleigh, NC 27615. Our thanks to Mr. Baker. April 12, 2018.